Create automated, near real-time SQL Server data warehouse solutions using Kore's Net Change technology to combine data from MultiValue and non-MultiValue data sources into a consolidated database. Integrate with best-in-class applications in real-time using RESTful Web Services, or via message-based data imports and exports. Extract and convert data in almost any format to assist with: implementing new applications, sharing data with partners, data migration and data archiving. Kourier Integrator can be implemented quickly, offers significant return on your investment plus it offers many other benefits to your organization. 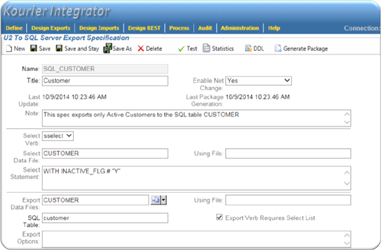 Kourier Integrator includes advanced features to support application integration and enterprise data warehousing requirements. The solution pricing includes all the software and services needed for a complete data integration solution, and we'll even help you with your first project. Note that Kourier Integrator solutions are typically installed on your servers (application, web and database) and must meet certain minimum requirements, contact Kore for details.